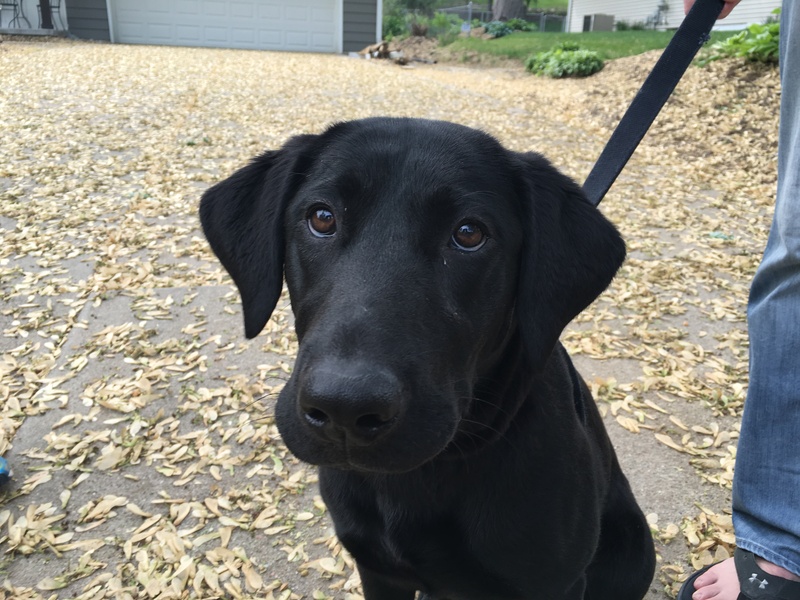 Lilo is a ten-month-old Black Lab mix in Omaha Nebraska who was feaful of the kennel until her guardians started using some of my techniques. That said, she still howls and gets nervous when the kennel door is closed; destroying two kennels in the process. She also barks alarmingly at men she doesn’t know. One of Lilo’s guardian’s parents delivered the dog from doggy daycare minutes before I arrived so I was expecting to encounter a calm and worn-out dog. Instead I walked into a symphony of barking. As I mentioned at the end of the above video, petting a dog to try to calm it down or console it is a common mistake that many people make. Because dogs learn through association, they relate the praise they are receiving from the guardians to the reaction that they are projecting towards the visitor. In other words, petting a dog in this state only reinforces the reaction from the dog. A better technique is to get in between the dog and the door with the guardian facing the dog and the door at their back. This enables the guardian to claim the area around the door by marching directly at the dog, causing it to move away. Only once the dog is calm and remains behind whatever boundary the guardian establishes, should they open the door. Once inside, I sat down with the guardians to discuss the situation but had difficulty hearing them because of Lilo’s reactive barking. We waited a couple minutes to see if she would settle down but when she did not I pulled out a leash and had her guardian place it on her, then hand the leash to me. My goal was to prevent her from running away while barking which she had been doing. I also wanted her to learn that just because she was near a man that she did not know, that did not mean that the man was going to touch her, interact with her or harm her in any way. I attempted to use a couple of different methods to reassure her and calm her down which worked in a limited capacity. Eventually Lilo did calm herself down and stopped barking. This gave her guardians and I an opportunity to discuss her day-to-day routine and what structure they had incorporated into her life. As it turned out, the guardians didn’t really have many rules or boundaries in place for their dog. Because dogs go through life probing to determine boundaries and limits, not having any rules for a dog, especially a puppy, can confuse the puppy into thinking that it is on equal footing with the humans they live with. I suggested a number of small changes that the guardians could make to their day-to-day routine such as always following through, always outlasting the dog, asking the dog to come to them rather than chasing the dog as well as a few rules like sitting before getting to go through a door, not being allowed on the furniture and having to keep her distance from humans who are eating food. I also stressed the importance of timing when it comes to rewarding or correcting Lilo. Because dogs learn through association, it is imperative that we correct or reward them within 1 to 3 seconds of the dog engaging in the activity. I also recommended that they stop using adjectives and adverbs (good, bad, go, etc) and instead only speak the command word or correction sound. Next I went over a dog obedience training exercise that will condition Lilo to “come” on command. This type of dog obedience training will go along ways towards helping Lilo see and respect her guardians as authority figures. Going through puppy training, a lot of people focus on how to correct or disagree with the puppy who is doing something they do not like. While this is certainly important to do, I find it more effective to focus on rewarding the puppy for engaging in desired actions or behaviors. This isn’t something you need to go to dog school to achieve if you do it throughout the day. To help the guardians get into a habit of rewardingly Lilo for desired actions, I went over a technique that I’ve developed called petting with a purpose. This technique involves petting the dog only after it does something to earn praise like sitting, recalling on command or laying down when instructed to do so. Next I showed Lilo’s guardians a technique that will help her learn to become comfortable inside of her kennel. The guardians had gotten off to a good start by incorporating a few of the techniques that I like to use, but they left out a couple of crucial elements. One of these is conditioning the dog to stay inside the kennel with the door wide open and the human in the room. Because there is nothing but air between the dog and exiting the kennel, it is the dog that has to do the work. This means the dog needs to develop self-control as it understands that it cannot exit the kennel without the human’s permission. Additionally practicing having the dog stay inside the kennel for gradually longer and longer periods of time while the humans are there removes the negative association of humans leaving when the dog enters the kennel. Basically Lilo’s guardians need to practice having her stay inside the kennel in a completely calm frame of mind while they are there for gradually increasing periods of time. This helps Lilo remain relaxed, and eventually being relaxed in the kennel becomes her default state of mind. I gave her guardians instructions and how to gradually ramp up the amount of time she spent in the kennel and the various steps to accompany it. I also recommended that they do not place her in the kennel when they are gone during this transition and instead take her to doggy day care when they have to go to work. It will take a week or two, but eventually Lilo will start looking at the kennel as her safe place to go; almost as if it is her personal apartment. One of the other issues that Lilo’s guardians wanted me to help with was her behavior when on a leash. Like many dogs do, she liked to pull and went wherever she felt like going. This can cause a lot of frustration for the dog handler and is not a very pleasant experience for the puppy either. I pulled out a Martingale collar and showed her guardians how to apply the special twist of the leash to stop her from pulling. I also mentioned a trick that people learn in puppy school; only proceeding when the puppy is in a completely calm and balanced state of mind. Because we live such a rushed lives, it’s not uncommon for people to move forward even though the dog is in an excited or anxious state of mind. But the energy your dog leaves the house with is the energy it is going to keep on the walk. A calm dog listens better and is far easier to lead on a leash. Spending a couple of minutes pausing whenever a dog starts to get excited, we can communicate that is the only way that we are going to head out for a walk is if the dog remains calm and relaxed. This is one of the dog training methods that I like best; simply adding a little bit of structure to a regular activity that the dog enjoys doing. This type of leash training will go a long ways towards helping Lilo understand how her guardians want her to behave on a walk. Before we could end today’s puppy classes, I went over a structured way of feeding Lilo. Because dogs eat in the order of their rank, simply asking the dog to wait while the humans munch on a couple of chips before they give the dog permission will go a long ways towards helping Lilo with her dog behavior training. Lilo is a great dog with a lot of personality. But because her guardians were trying to pet her when she was in an unbalanced state of mind and failed to provide her with the proper rules and boundaries, she had gotten the impression that she had the same authority as their humans. This likely stressed her out when they did not listen to her as an equal. But by the end of the session it was clear that Lilo was starting to adopt more of a follower’s of mindset. She was no longer barking at disagreement of things she did not like, she was sitting in front of her humans to ask for attention rather than nudging them and seemed to be looking up to them more often for guidance. By consistently correcting and rewarding Lilo with good timing, practicing being calm in the kennel and assuming the leadership role in her eyes, it shouldn’t take long for the puppy to understand what her guardians do and do not want from her.